First Race:- Aintree 19th September 2000. Favorate Curcuit:- Southern 100, Oulton Park, Anglesey (Pre 2007). 2002 Cheshire & North Wales Super Sport 400. 2002 Wirral 100 Formula 400. Ball and Chain Status:- Married, to Paula. Bin Lids:- Lauren (16) & Abbie (7). 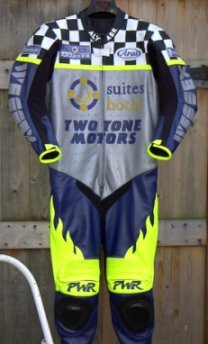 Made to measure leathers to your own designs. To see your product above please Click here. Not got a picture of the helmet at the present so here is a picture of me.